Queen Elizabeth II opted for a much more neutral outfit this week for her journey home to Buckingham Palace after an extended winter break. 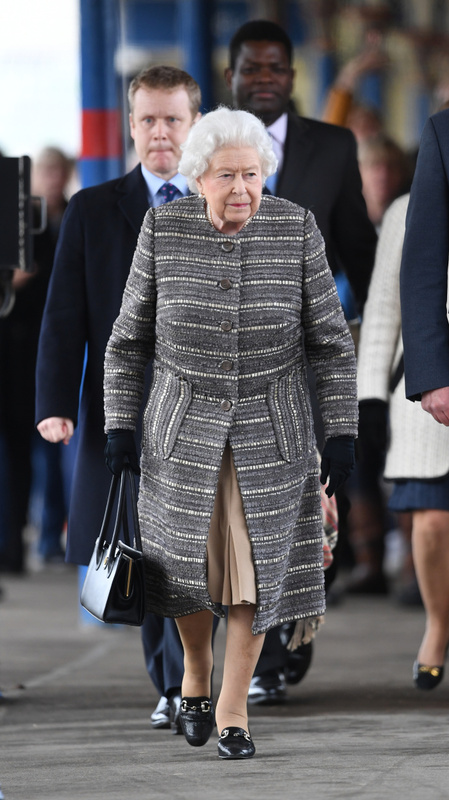 Her Majesty forewent her usual vibrant coloured clothes for a classic grey striped coat as she boarded the train back to London following an eventful few weeks. Although a stark difference from her previous outfits, the Queen still looked as lovely as ever, accessorising with gorgeous pearl earrings and a pearl necklace. As always the 92-year-old carried had her black handbag by her side while she wore her favourite black court shoes for the short walk through King’s Lynn station. The royal has spent the past couple of months in her Norfolk estate, enjoying some family time with husband Prince Phillip, grandsons Prince William and Prince Harry and other members of the royal family. However, it hasn’t all been relaxing, with Phillip involved in a horror car crash towards the end of the break. The Duke of Edinburgh was left shaken last month when the car he was driving collided with a Kia carrying two women and a nine-month-old baby on a quiet road in Sandringham, Norfolk. While the duke escaped unhurt, one of the other car’s passengers, Emma Fairweather, broke her wrist. According to multiple news outlets this led to Buckingham Palace confirming in a statement that Philip had chosen to surrender his licence in the wake of the crash. “After careful consideration The Duke of Edinburgh has taken the decision to voluntarily surrender his driving licence,” a palace spokesperson said. The prince wrote a letter of apology to Ms Fairweather following the accident, admitting his fault in the collision and wishing her all the best in her recovery. “I would like you to know how very sorry I am for my part in the accident at the Babingley crossroads,” the letter read, according to the Sunday Mirror. “In normal conditions I would have no difficulty in seeing traffic coming from the Dersingham direction, but I can only imagine that I failed to see the car coming, and I am very contrite about the consequences,” he reportedly added. Are you a fan of the royal family? What do you think of the Queen’s latest outfit?